Arizona Prison Watch: Corizon's deliberate indifference: fighting back. I received this piece of correspondence aboout Corizon's recent performance at the AZ DOC from someone on Donna Hamm's (of Middle Ground Prison Reform) email list. Corizon has the contract to provide health care to prisoners now. Please also print and send this post to your loved one, and send them copies of the AZ DOC health care access policy (DO 1101) and the grievance process (DO 802). That's the language they'll have to fight in if they are to survive their sentences. There's a pretty good prisoner's guide for handling grievances here, and my February newsletter touched on the issue of grieving problems accessing health care as well. Here is the Jailhouse Lawyer's Manual that I send parts of to prisoners: download and print chapter 23 if your loved one is struggling to get adequate (or any) medical care. Send them chapters 14 and 16, too, if they plan to sue the DOC themselves. Here's a list of attorneys I know are capable of suing the DOC as well. If your loved one in prison has suffered actual harm, has done the grievance process properly, and can make a compelling argument of deliberate indifference (which is a higher standard than simple negligence), you may find a lawyer willing to take it on contingency. Here is the actual complaint which forms the basis of the current class action suit agaisnt the DOC, "Parsons v Ryan". It's a good read for understanding what the ACLU does and doesn't think is unconstitutional in re: medical and mental health care in prison, in case you're trying to figure out how to gauge and respond to what your oved one is experiencing. Contact the ACLU-AZ, too, to report human rights abuses and deliberate indifference to prisoner physical and mental health - they're in on the class action. The people who are being prosecuted via Parsons v Ryan are AZ DOC Director Charles Ryan and DOC Health Services Division Director Richard Pratt. 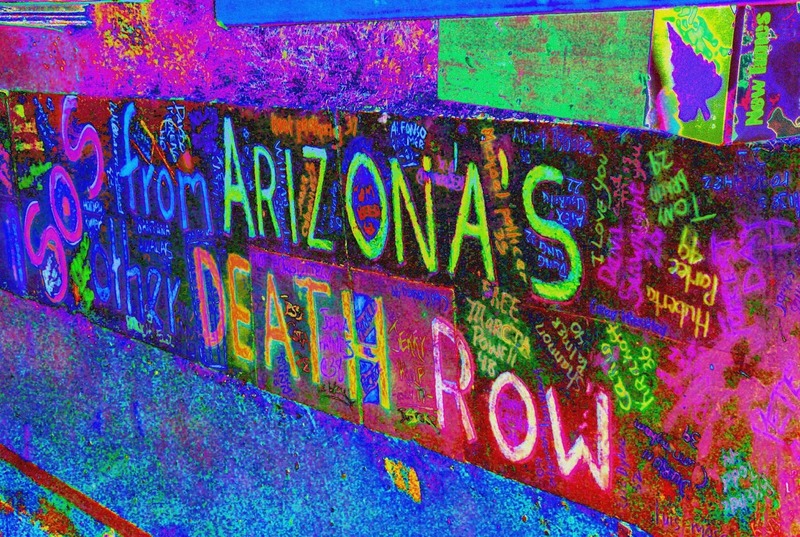 Their email addys are: cryan@azcorrections.gov and rpratt@azcorrections.gov. Those are the guys whose desks the buck is supposed to stop at, anyway. The AZ DOC street address, for registered, return-receipt mail (better than certified, I'm told), is 1601 W. Jefferson St. PHX, AZ 85007. Make sure the prisoner you care about is following the grievance policy to the letter, but nothing stops you from hitting up those guys for help if corizon isn't doing their job - it will take less time to pressure them with your legislators in tow than it will to sue them into compliance. I can usually be reached at arizonaprisonwatch@gmail.com or 480-580-6807 if you nee dmore help than this - just keep in mind that I'm just a civilian - I'm certainly no lawyer. I just believe in mutual aid and have figured out some ways to help prisoners and their families help themselves, so I'm willing to share. Please also feel free to contact me with your own stories and tips for survival for me to share with others, as well. As you know, I have many contacts within the Dept. of Corrections, both among the staff and the inmate population. It has recently come to my attention that there are serious concerns about the delivery of healthcare to inmates throughout the entire prison system as contracted with Corizon. In particular, there are special concerns about the treatment being afforded to mental health patients. While my specific comments below are focused on conditions and practices at the Eyman Complex (which consists of SMU I and II, Meadows, Rynning, and Cook units), I strongly suspect that the same problems exist system-wide. Therefore, this letter is intended to address problems on a system-wide basis that are similar to the specific ones that I will mention in this letter regarding the Eyman Complex. It will not be acceptable to conduct an investigation into what is happening at the Eyman Complex; it is necessary to learn if the same problems and issues are taking place throughout all facilities under contract with Corizon. As reported to me by reliable sources who have requested to remain anonymous, there is presently only one psychiatric nurse in the entire Eyman complex. As of April 30, 2013, the Eyman Complex housed over 5,100 prisoners. Prior to when Wexford took over the medical care for inmates, there were 4 to 5 such nurse positions at Eyman. The Wexford contract mandated that all inmates with Mental Health classification scores of Level 3 or above were required to be seen at least once/month by a Mental Health provider. Such provider could be an RN, a Psych Associate, a Psychologist or a Psychiatrist. Psychiatrist appointments were scheduled every 3 months or sooner if deemed necessary through referral or via an inmate’s own HNR request. This deliverable, under the present contract with Corizon, has been deleted and services are now set at the level of what the Department mandated of itself prior to Wexford, which is a Psychiatrist visit once every 6 months, and a Psych RN visit every 3 months. Notwithstanding the obvious implication that this deliverable was reduced in contract negotiations with Corizon simply to save money, it will be impossible for one Psychiatric Nurse to accomplish even every three months. Who will screen the HNR’s that refer to medications or negative side effects? Apparently, Corizon functions in other states with no psychiatric nurses at all; instead, they allow regular medical nurses to assume those duties even though psychiatric nurses have special training to deal with psychiatric patients. RN’s without psychiatric training or experience cannot assess psychiatric symptoms. At the Meadows Unit, and very likely at other units as well, nurse positions (medical nurses) are being slashed by Corizon. The staff at Meadows have been advised that they will have 2 nurses with 1 supervisor. The unit has, as of April 30, 2013, about 1,200 men, including an 80-bed CDU. On Meadows Unit, there are approximately 330 inmates who have MH scores of at least Level 3. A supervisor, Nicole Bradfield, resigned about a week ago because she was working 60 hours/week at a salaried position (no overtime) and saw no reprieve to this schedule. There are apparently several LPN’s on the unit, but they are not qualified nor licensed to make assessments and must function under the supervision (on site) of an RN. As noted above, they cannot assess psychiatric symptoms due to lack of training and experience, not to mention not being qualified by licensing to do so. The Meadows Unit has about 60 insulin dependent diabetics. Glucose tabs are now non-formulary and a paste has been substituted (to save money?) With the paste, it is much more difficult for the nurse to know how much to use to augment the sugar levels. Also, the unused paste is discarded after the package is opened. This would seem to be an expensive, waste. Medical nurses are unable to complete their tasks and this directly and negatively affects patient care. Supervisors have been getting prescription renewals with verbal orders without readbacks. A readback is essential to insure that the specific information communicated has been accurately understood. Noting orders are not being completed. Once orders are written, they have to be implemented. They have to be noted, sent to the pharmacy, etc. My sources advise that on one day recently there were three stacks of charts (total number unknown) that had been sitting on the desk for two days. The nurses have to make a decision about whether to do the nurse line or note the orders. On some days, there can be as many as 5 ICS’s. These emergency incidents obviously halt all other duties the nurses are doing in the health unit. The Meadows Unit has a psychologist who does watches every morning at Browning Unit. This severely dilutes the time she is available for direct patient care or consultation. It has been reported to me that the Meadows yard has many elderly patients who are medically compromised. New policies are issued by word-of-mouth. Outside consultations with specialist are not being scheduled. Suicides at the Eyman Complex seem to be increasing in frequency (1). The list goes on. It is my understanding that there is an assigned Contract Monitor who is employed by ADOC whose job is to insure contract compliance. What is this person doing? Clearly, the Department must avoid similar problems to the ones you had with the Contract Monitor who utterly failed to do his job at the Kingman private prison facility, which ended in tragedy and enormous liability for the State of Arizona. We are calling for a full-scale investigation/audit of the contract with Corizon. Audits need to be conducted of contract compliance in each unit of every prison where Corizon provides medical care. All prisoners have a well established constitutional right to the community standard of care for their serious medical needs. The Department has both a legal and ethical duty to provide mandated medical care. I hope to hear from you that an investigation/audit will be ordered, and please consider this as a public records request, pursuant to A.R.S. 31-121 et seq., for any/all records you may have (written, electronic, audio, video, telephonic) or which you produce within the next 90 days which deal with Corizon’s contract compliance. 1. Within the last month, there have been three suicides at Eyman Complex (Joaquin Tamayo # 106163; Paul Henderson # 247636 and Milo Stanley # 064794) which lend credibility to the fact that mental health care is wholly inadequate.